Hometown: Maple Shade, New Jersey, U.S.
Died: December 3, 2004 in Operation Iraqi Freedom. Unit: Army, 65th Engineer Battalion, 25th Infantry Division (Light), Schofield Barracks, HI. Army Spc. 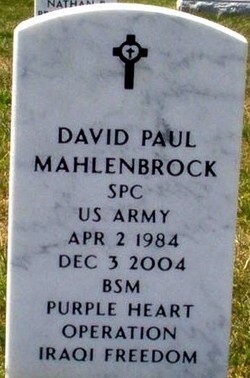 David Mahlenbrock was killed in action near Kirkuk, Iraq last week. He was a combat engineer who cleared roads and swept for mines. He was only 20 years of age. He leaves behind a 19 year old widow and a 10 week baby girl named Kadence. The only time he saw Kadence was on a visit home in September 2004. Army Specialist David Mahlenbrock had a special request should he die in the line of duty. In a letter to his fellow soldiers in July, the young combat engineer asked that Toby Keith's song "American Soldier" be played at his funeral. It was a wish no one ever wanted to contemplate. Yesterday his family tearfully granted it. Keith's song echoed through Holy Trinity Evangelical Lutheran Church in Mahlenbrock's native Maple Shade, a sound track to the life that hundreds gathered to remember. The words couldn't drown out the heaving sobs that filled the Burlington County church as family, friends and strangers mourned the death of a young soldier, husband and father. Mahlenbrock, 20, whose job was clearing routes to ensure the safe passage of fellow soldiers, died December 3, 2004, when a bomb detonated near his humvee just outside Kirkuk, Iraq. Yesterday, as Mahlenbrock's song played, his older brother, Christopher, 21, an Army reservist who helped carry the flag-draped coffin, wrapped his arm around younger brother Andrew, 16. Mahlenbrock's 19-year-old widow, Melissa, cuddled his 11-week-old daughter, Kadence, bundled in tiny black clothes in honor of a father she'll never know. In a music-filled ceremony punctuated by biblical readings, friends and relatives remembered a man who gave everything his all, from his days as a scrappy football player and wrestler at Maple Shade High School to a soldier fighting for his country. Mahlenbrock, who had joined the Army after graduating in 2002 and left for Iraq in January, planned a career in the military. "Devotion... was written all over David's life," said the Rev. Carl E. Joecks, church pastor. But Mahlenbrock, Joecks said, was most devoted to his wife, whom he met at age 14 and married last year. When she took a job at one point at the Bed Bath & Beyond in Cherry Hill, Mahlenbrock would walk or jog the seven-mile round trip just to be with her on her 30-minute lunch break. When Mahlenbrock became a father in late September, he threw himself into that role with equal passion. When he returned home on leave to see Kadence, then about a week old, he couldn't put her down, Joecks said. "He threw a lifetime of fatherly love into that two-week leave," the pastor said. Mahlenbrock would never get to meet his half-brother, Darek, born three weeks ago. Mahlenbrock always had an affect on those who met him, family and friends said. He would do crazy things just to get someone to crack a smile, Joecks said. "I see the world in a different way," said Mahlenbrock's father, Russell, choking up at the microphone. "David has changed me from the inside out." Christopher Mahlenbrock urged the teary crowd to spend time with their families at Christmas, let them know they are loved. "Because you don't know when they will leave, when they will be taken away from you," he said. David Mahlenbrock knew the possibility of death was real. He wrote the July letter to his squad mates after a scare involving an explosive. "If you are reading this, then I've died for our country," he wrote in the letter, supplied by Soldiers' Angels, a nonprofit organization devoted to providing aid and comfort to soldiers and their families. "I just hope it wasn't for nothing." In it, he asked that his wife get a few special items, including a dog tag with the couple's picture and an American flag he kept in his left breast pocket. And he asked that "American Soldier" be played at his funeral. It was a request taken seriously by Soldiers' Angels, which tried but failed to get country crooner Keith to sing at the service. Instead, it put out the word to radio stations across the country to play the song at 1 p.m. EST tomorrow, the day Mahlenbrock will be buried at Arlington National Cemetery. "If you can't get to a radio station, then play it or sing it," said Patti Bader, founder of the group. "If all of America plays that song, that's what he wanted." He also wanted bagpipes, which accompanied his casket as it was carried out of the church. After the ceremony, Christopher Mahlenbrock, who works funeral honors detail as a reservist with the 656th Area Support Group in Willow Grove, led a salute to his brother. A white-gloved hand raised to his temple, he solemnly stood as the silver hearse carrying the casket drove away. Burying a brother would be enough to scare many away from a wartime tour. But Mahlenbrock's brothers are even more resolute about pursuing careers in the military. "I don't want to go over there. No one wants to go over there," Christopher Mahlenbrock said. "But I feel it's my duty to go, to understand what my brother went through." Andrew said he still planned to serve four years in the Army, Navy or Air Force, then go to college and join the reserve. "I feel even more now that I should go into it, do my duty... and get some payback," he said.